In an announcement made on Sunday, April 14, TBS junior girls basketball player Aniyah Vanhook was named the Times News All-Region Player of the Year. Vanhook was one of three TBS players to claim first-team all-region accolades as teammate Molina Williams joined her on the girls' side and Ja'Dun Michael picked up recognition on the boys' side. Honorable mention honors went to senior Michael Wade and junior Mylyjael Poteat. Vanhook netted her 2,000th career point during the 2018-19 campaign as she helped the Spartans capture the first girls state championship in school history. 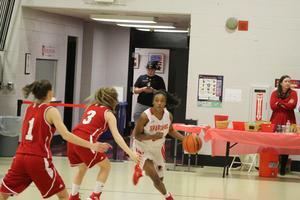 She averaged 19.5 points, 6.0 rebounds and 4.8 assists over her junior campaign. Williams also played a big role in the Spartans' 25-1 season. The junior put up 14.2 points, 10.2 rebounds and 4.3 assists per contest. Michael helped TBS to a 24-7 ledger and averaged 17.2 points and 6.4 rebounds per game. The sophomore shot 54 percent from the field.